In the art world the word "palette" has two different but related meanings. One meaning is the physical surface that an artist mixes his paints on. The other meaning is the tube colors the artist chooses to put out to start. I'm going to talk about both of my "palettes" here briefly. Acrylics require special consideration due to their rapid drying time. 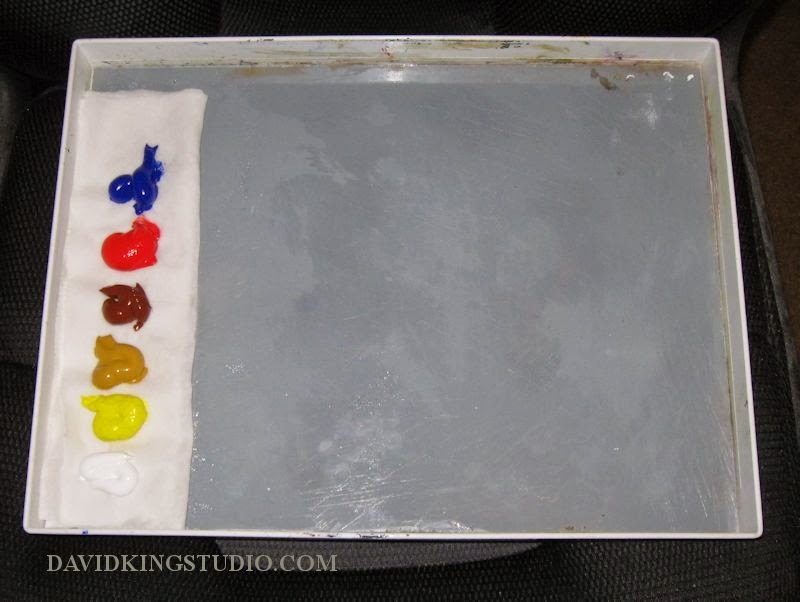 Different "wet" palettes both commercial and home made have been invented to keep mixes usable and preserve unused paint. One of those is the Masterson Sta-wet palette. This is basically a plastic box with a sealed lid about 12" X 16" and about an inch deep. The design is intended to be used with a sponge and paper to mix your paper on. The theory is that the sponge will hold enough moisture for the paints to absorb and keep them fresh. In practice it isn't so simple, the amount of moisture is hard to regulate and I often had too much which results in my paint piles turning into intermixed paint puddles. I also didn't really care for the mushy feeling of mixing paint on top of a sponge, also mold was frequently an issue. I ended up tossing the sponge and paper and replaced them with a piece of 12" X 16" glass which fits perfectly inside the box. I roughed up one side of the glass with sandpaper and sprayed it with gray automotive primer which comes very close to being a perfect mid-tone gray. The glass is placed with the primer side down. I take a piece of Viva paper towel, (I only use Viva, all other paper towels are too wimpy.) 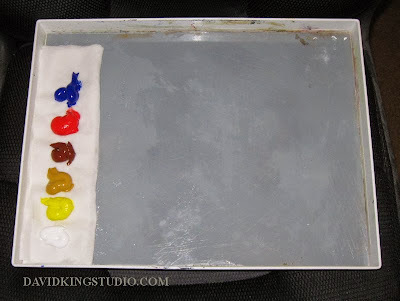 fold it and wet it, just damp using a spray bottle and place this at one end of the palette and I place my paint piles on this. Now a note about the other meaning of "palette", the colors. These are the six colors I put out every single time I paint from left to right, (all Liquitex Artist's grade acrylics.) titanium white, cadmium yellow light, yellow oxide, burnt sienna, cadmium red medium and ultramarine blue (green shade). This is basically the three primaries plus two earth colors and white. Since I mostly paint landscapes always having the two earth colors, (yellow oxide and burnt sienna) on my palette is well worth it. Some of you may remember about a year ago I had a post about converting Richard Schmid's oil palette to Liquitex acrylics and making color charts based on it. Well, I deleted that post because I never finished the charts and stopped using that palette, it was just too many colors to manage for my taste. However, there is not such thing as a perfect primary color in pigment so there are occasions where I add to my basic palette. For example, if I need strong violets I put out alizarin crimson, (hue, permanent) and if I need the color really strong I also put out cobalt blue. This is because cadmium red medium as a little bit of yellow in it therefore a pure violet can't be made with it since yellow is violet's complimentary. There's a similar issue with the green in the ultramarine blue. I recently discovered pthalo blue, I loved it for the shadows in "Winter Ditch" so now I occasionally put that out on the palette. I sometimes get out the cerulean blue for skies as well. Occasionally I get out yellow hansa it makes a particular kind of red orange I like for replicating the color of some of the fall foliage, why it works I really don't know. If the painting is going to have a lot of strong orange in it I'll put cadmium orange out. 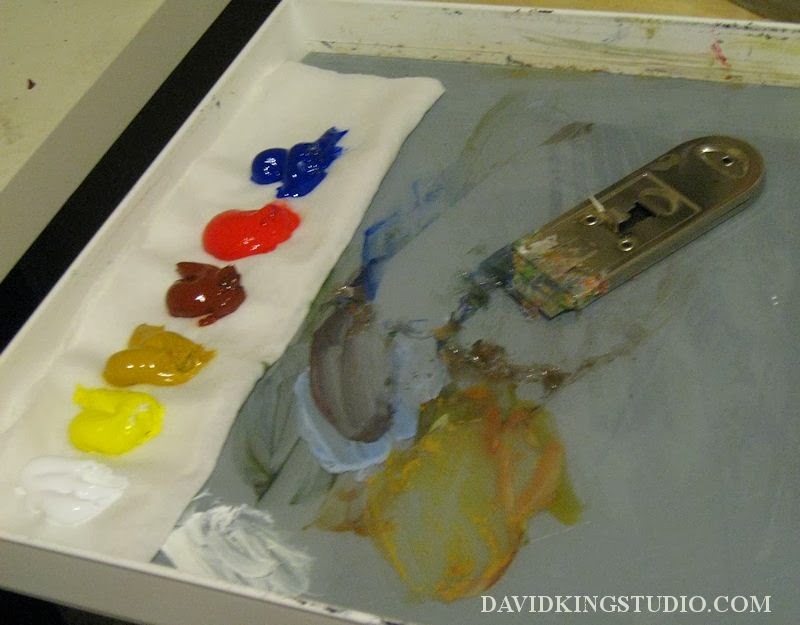 When I'm at the end of a painting session or if I just need a clean palette I spritz the palette with some water and get the paint scraper out and in moments I have a clean palette. I also spritz the paint piles and then seal the box with the lid and those paint piles will keep for weeks if need be.